Lester Schoolmeester, 88, of Edgerton, formerly of Chandler, died on Thursday, April 27 at Sanford Hospital in Sioux Falls, SD. Visitation will be from 4:00 - 6:00 pm Sunday, April 30, at the Chandler Funeral Home. Celebration of his life will be held on Monday, May 1 at 10:30 AM at the Chandler Christian Reformed Church, with interment following the service at the Chandler Memorial Cemetery. 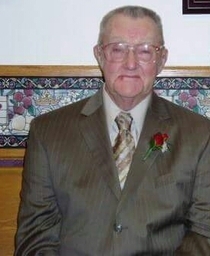 Lester Charles Schoolmeester was born on July 4, 1928 to Charles and Mae (Kleinjan) in Pipestone County. He was baptized in the First Reformed Church of Edgerton. He graduated from Edgerton High School. After graduating he worked at the creamery and for a local plumber. Les joined the Army for two years and was stationed at Fort Hood in Texas. He was discharged in March of 1953. On June 9, 1953 he married Wilma DeVries in Edgerton. They moved to a farm outside of Chandler, MN where they lived for 55 years, until October of 2008 when they moved into Chandler where he lived until he moved to assisted living in Edgerton. While living on the farm they were members of the Chandler Christian Reformed Church. He served as a Deacon, Elder and on the Chandler Christian Grade School board. When not working on the farm he enjoyed fishing and going south in the winter. The day before his wife’s birthday, Les left his earthly home to live with his Heavenly Father on Thursday, April 27, 2017, at the age of 88 years. Les is lovingly remembered by three daughters, LuAnn (Arwin) Spronk of Edgerton, MN, Darla (Fred) Koelewyn of Plano, TX, Lorna (Jeff) Hulstein of Chandler, MN; two sons, Glen (LeAnne) of Chandler, MN and Dean (Wendy) of Pipestone, MN; 23 grandchildren, 13 great-grandchildren; brother-in-law Lee (Jean) DeVries of Middleville, MI; 4 sisters-in-law, Alvina Schoolmeester of Edgerton, MN, Loreen DeVries of Chino, CA, Helen DeStigter of LeMars, IA, Linda (Jack) Northouse of Freeport, MI and Donna (Ted) Weerstra of Holland, MI, and many nieces, nephews and friends. He was preceded in death by his parents, Charles and Mae; wife, Wilma; daughter, Karen; step-mother Vena; parents-in-law Evert and Martha DeVries; brother, Orvin; and brother-in-laws Albertus DeVries and Jerry DeStigter.